Automatic and smart care of plants by proper watering and their monitoring. A very good quality and efficient DC MOSFET. Well if you want to actually make it..
To make the irrigation system in gardens, farms and backyards more smart and automatic. Also to monitor the soil conditions. I have observed many a times that in some parks, water is not given properly to plants. There is overwatering (like a lot) at some plaes and completely dry (where vegetation dies) in some other. Across the Globe. almost 30% of irrigation water is wasted in over watering. To solve that I planned to make a device that controls the irrigating system properly. So that there is no over watering and all plants get the "required" amount of water. To solve this problem we can make a Internet connected device that controls he irrigation system. For better controls we need to also monitor the temperature as soil temps above 35C are also harmful for plants. And by watering little water we can reduce the temps. For Soil Moisture, a generic sensor can do the Job but a capacitive one is recommended. A good MOSFET- Infineon CoolMos MOSFET // for DC switching // Most Irrigating Motors/ Pumps/ Solenoids operate in DC // And it has less V drop. // and less current to run. 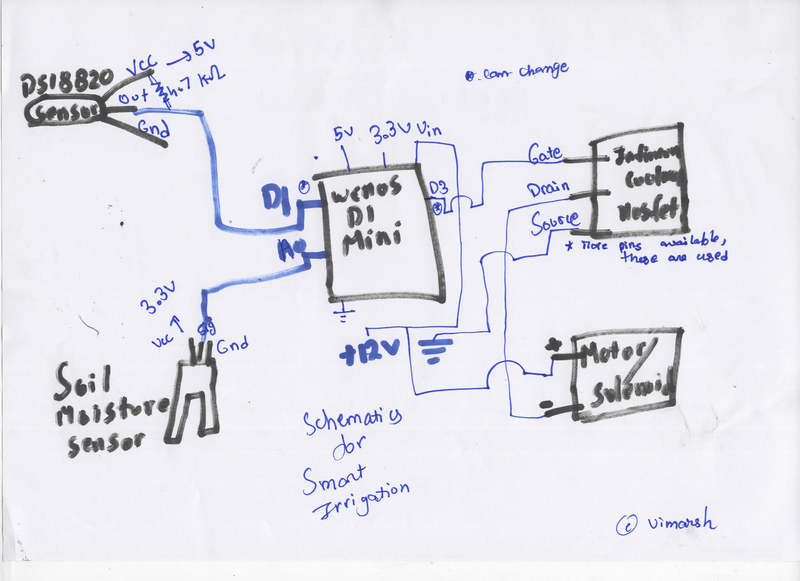 The wiring scheme (schematics) have been attached below. To keep the soil moisture appropriate to plant’s requirement. No need to worry of plant’s wilting when no one’s there to water your plants. The Soil Temperature and Moisture sensor data is read by the MCU which sends that data to Blynk Cloud (the easiest and quickest tool). Then we can see the data on our smartphones with Blynk App and its Eventor Widget (the best one for me) easily can check the conditions and we can do the switching (of water) job without long code. Connect your MCU to PC and do all installation of boards and Arduino IDE (google search is good for that info) and upload the code attached. The code is very self Explanatory and simple. Just don't forget to install Bkynk and Dallas Library. You can change the widgets and tabs etc..
You can also add Email and Phone Notifications. Don't forget to change soil moisture values, because it is different for each soil, sensor and calibration method. Don't Forget to make your device waterproof, but hot gluing a box, or using simple plastic bag (like I did). If you want a permanent setup, solder the pieces together or get a custom PCB. There are some chances of Improvement, if not using Internet, Main one being the code, which needs to do the condition checking with simple "ifs" locally. 1 / 3 • I just put it in soil upside down as I realised that I had put Soil Moisure Sensor on wring side. The project works. I took it to several parks to test it out and it works there as well with little adjustments. The CoolMos MOSFET works really well. To switch AC two of them can be used (but I used on 12V DC instead of max 600V for safety concern). It consumed less current than a relay so can be directly addressed from a even 3.3V MCU (though I don't know how did it work). Overall, being so small CoolMos SJ MOSFET is silent, efficient and reliable for its work. Change the values of token, ssid, pass and other pin definitions according to your requirement.